From the moment of transcription, RNA molecules are continuously bound by RNA-binding proteins (RBPs). While the majority of research has focused on how these RBPs regulate posttranscriptional gene regulation of messenger RNAs (mRNAs), the majority of cellular RNAs do not code for proteins, such as ribosomal RNAs, transfer RNAs, and microRNAs. Since these RNAs do not code for protein, their function is mainly determined by their interactions with RBPs as well as their intramolecular base pairing, or RNA secondary structure. One class of noncoding RNAs termed long noncoding RNAs (lncRNAs) have recently become the subject of intense research interest. To study the function of lncRNAs in eukaryotic cells, it is important to examine both their interactions with RBPs as well as their RNA secondary structure. Protein interaction profile sequencing (PIP-seq) is a genome-wide method that uses structure-specific ribonucleases (RNases) to identify regions of double-stranded and single-stranded RNA as well as regions that are protected from these RNases, which represent sites of RBP binding. This method is a very powerful way to examine RNA-protein interactions and RNA secondary structure of all lncRNAs expressed in cells and tissues and can reveal cell-type-specific or tissue-specific patterns of these RNA features. 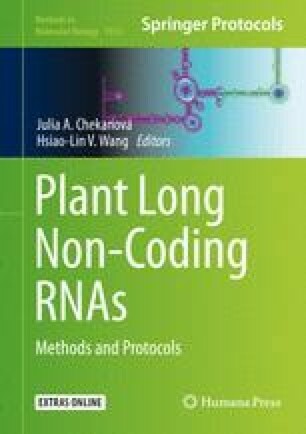 Here, we give a step-by-step account of performing this technique for comprehensively analyzing RNA–protein interactions and RNA secondary structure in plant transcriptomes. The authors would like to thank the members of the Gregory Laboratory both past and present for helpful discussions. This work was funded by NSF grants MCB-1243947, MCB-1623887, and IOS-1444490 to B.D.G.